VHS DVD burn combo 700, originally uploaded by Buck Cash. Well, she's finally about done with her run. 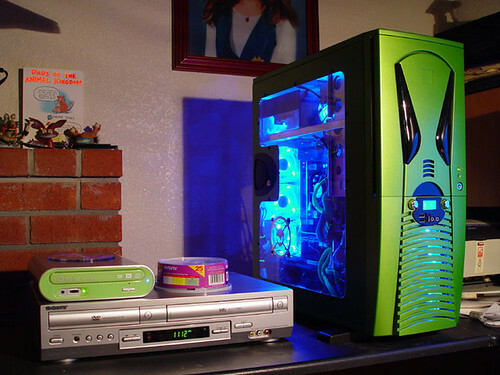 The beauty pictured above is the machine I built while in San Francisco about 5 years ago. She was a real heavy workhorse speed demon in her prime, but now she's an old dog with a clogged up XP Pro registry that sometimes takes as long as 10 minutes to boot up. She's not dead though. I've put together a new Vista machine that is my new whiz-bang heavy workhorse speed demon to replace her, and I've got nearly all of my important files and programs transferred and set up at this point. Once I've finished with that process, I can format C: on the old girl and reinstall a fresh copy of XP, which will get her running clean and lean again, and as fast as possible, considering her older hardware and architecture. Maybe I'll just give her to Casey. She needs a machine since her laptop was stolen. With my new machine, I'm going deeper into the land of super-storage to accommodate my growing library of photography images. Between the Camera RAWs, the Conversion TIFs and the Photoshop PSDs, and a need to keep everything backed up on at least two (preferably three) separate hard drives at any given time, I use a lot of space. Add to that the huge files associated with my digital video camera, and we're talking serious storage needs for a geek like me. I don't even think in terms of Gigabytes anymore. It's all about the TB now: Terabytes - lots of 'em. Too many to fit inside my main system enclosure, so I'm starting to work with external hard drive enclosures. So, 1 TB is one thousand Gigabytes or, if you like, one million Megabytes, or one billion Kilobytes, or one trillion Bytes of information. With my new machine, I've put together 10 times that: 10 Terabytes = ten thousand Gigabytes = 10 million Megabytes. Yeah, that's what I'm talking about. And that's to start with - it's still expandable from there. For some added perspective (just some idle musing here), the first hard drive I ever had, back in 1990, was a whopping 40 Megabytes. What I have now in terms of storage is like having 250,000 of those hard drives all hooked up together. The cost-per-Megabyte back then was right around $10, so you could expect to pay about $400 for a 40 Megabyte hard drive at that time. At those prices, I've got about $100 Million dollars worth of hard drive space here! LOL! That was fun. Anyway... because of the huge volumes I want to work with, I need speed. USB won't work for my needs, not even USB 2.0. It's just not fast enough to work with that much volume efficiently. E-SATA II is the ticket for this jazzy super-storage setup for my insane geek and photographer needs. Here's how it works: I've got a 2 port E-SATA card plugged into the PCI-E slot on my motherboard, which is a pretty fast interface bus. Plugged into those two ports via E-SATA cables are two 5 port multipliers, giving me 10 external E-SATA ports. Plugged into each of those 10 ports is a 1 TB SATA II hard drive, housed in external multi-bay hard drive enclosures made just for the occasion. Very big storage, very small footprint, very fast, very efficient, VERY cool. I also upgraded to Photoshop CS3 and Lightroom, and they look fantastic and work REAL user-friendly with all the real estate of my new 24" wide-screen monitor with 1000-1 contrast on a 1920 x 1200 px calibrated screen. If you have a need for some big storage solutions, check out the folks over at Addonics dot com. They've got the goods you're looking for. Dragonfly 8227, originally uploaded by Buck Cash. 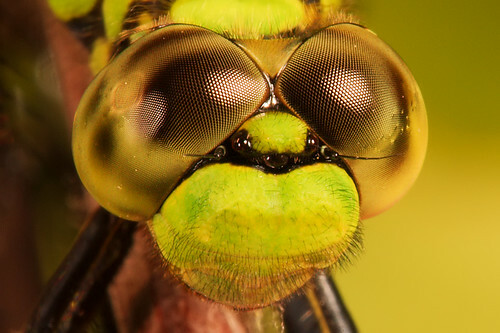 Here's a shot I've long wanted to be able to get: a serious closeup of a dragonfly's eyes. Now that I've got the gear to do it, here it is! You can see the full size of this photo and a few more from this series (and all the rest of my photography) by clicking on the picture. That will take you to my flickr account. 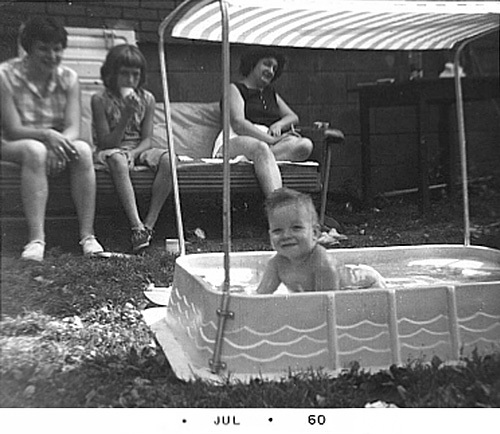 Buck Pool 1960, originally uploaded by Buck Cash. It's my 49th birthday today. Time flies when you're having fun. Maybe I'll think of more to say later. It's still pretty early in the morning here. Pescadero Sandman, originally uploaded by Buck Cash. The photo is one I shot years ago at Pescadero Beach on the California Coastline. It's a really wonderful, magical place with a vast area of tide pools full of little creatures and life - all trying to eke out an existence. 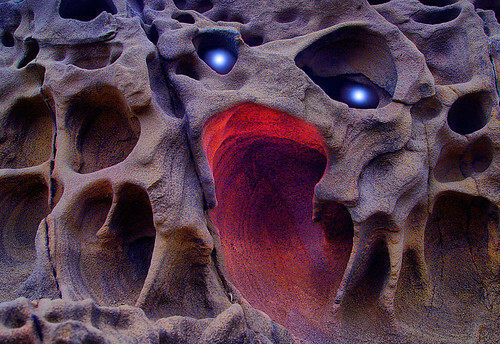 Lurking above them are these sandstone cliffs that are just... other-worldly looking. I just happened across a few of those old images and started playing with them for no particular reason while listening to Bush's latest bull-spin on the economy, and this is the result. Kinda spooky and scary, huh?